I'm wearing the Stars and Stripes American flag design and as you can see, these tights are beyond kooky and not for the faint of heart. I won these in a twitter competition held by Pretty Polly a few days ago and road tested them (in the safety of my house) tonight. I was pleasantly surprised by how strong these tights are and I can't see them getting any pesky ladders anytime soon, which is always a welcome bonus. They're pretty opaque too, so I almost felt like I was wearing leggings. For my American comrades, I think these would be a very cool addition to their Olympic season wardrobes - what a fabulous way to support your nation in the games! ...and of course for the Brits there's the Rule Britannia Union Jack version. Because I have a British passport, surely I can justify getting these too right? Right? 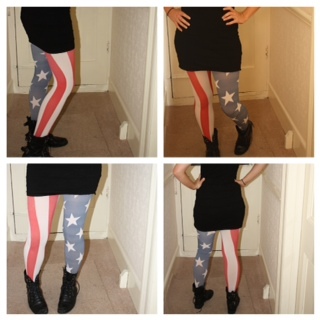 The flag tights retail at £15. Take a look at them online here and follow Pretty Polly on twitter if you like to get your tweet on! What do you think of the flag tights by Henry Holland for Pretty Polly? Will you be rocking patriotic pins anytime soon?